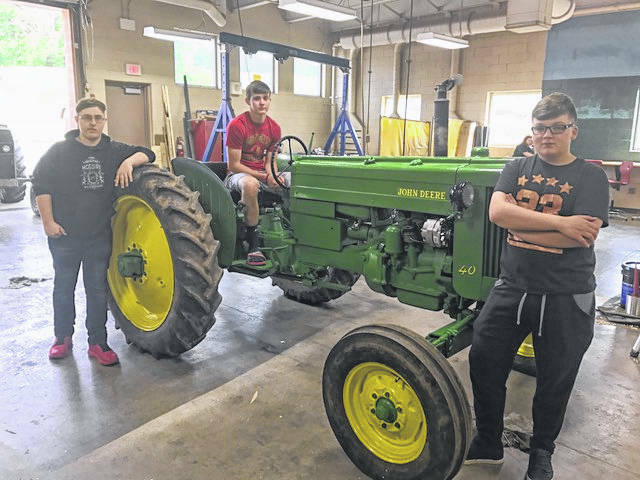 Students in the Mechanical Principles class at South Gallia HS spent this term working on a 1953 John Deere tractor. The tractor was completely reconditioned by the students including converting to 12 volt electronic ignition and a new paint job. Pictured are Kyle Northup (owner) sitting on tractor with classmates Zach McGuire and Shawn Ward. The Mechanical Principles class is offered through the Vocational Agriculture program at South Gallia under the instruction of Dave Pope.